Interested in supporting Her Voice Carries as we embark on our national tour? Here are some of the ways listed below! Limited Edition Her Voice Carries Market Bag (Rochester Edition). A Kari Petsche design. A limited edition two color screen print (metallic gold and gray) on french paper. This poster features a map of Rochester NY showing which quadrant all five women, KaeLyn, Imani, Trelawney, Safi and Rachel, live and make an impact. Film by David Marshall with Co-producers Christine Christopher and Hélène Biandudi-Hofer. 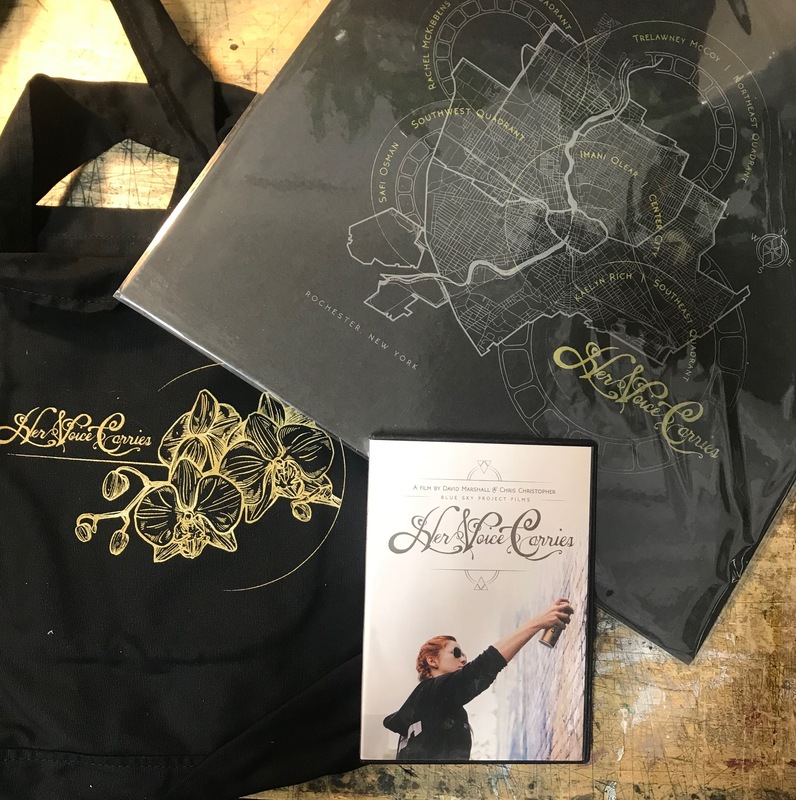 This purchase will go towards funding the next phase of the project as well as owning your limited edition copy of Her Voice Carries DVD. Additionally, your name will be added to our Supporters list. With your donation we will be able to cover the physical costs of one mural. Your sponsorship will be publicly thanked on social media, press releases and the website as well as included on the final wall plaque. Additional perks include a HVC Poster, bag and hand written and drawn thank you card from artist Sarah C. Rutherford. We are actively looking for partnerships as we expand this project to the national stage. Please inquire below if you are interested in learning more.